In these definitive collector's boxed sets with completely remastered sound, fans of the landmark series can finally own and enjoy the entire third season, featuring hours of new and never-before-seen bonus features. They’re back with more single season packages, but these finally remaster the shows. I’ll look at the quality of these new transfers in the tech area of this review. Since this is my third examination of Trek’s “Original Series”, I won’t reiterate my thoughts about the various episodes here. If you’re interested in my comments about each of Season Three’s 26 shows, click here and give them a look. 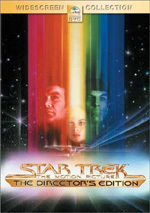 Star Trek appears in an aspect ratio of 1.33:1 on these single-sided, double-layered DVDs; due to those dimensions, the image has not been enhanced for 16X9 televisions. Of the series’ three seasons, the original Season Three DVDs looked the best. However, they still demonstrated nice improvements via these remastered episodes. Across the board, sharpness looked quite good. A minimal amount of softness occasionally interfered, but nothing series arose. Instead, the episodes consistently demonstrated good delineation. I witnessed no issues with jagged edges or shimmering, and edge enhancement wasn’t a factor. Nor were print defects – at least not most of the time. Oh, we still saw sporadic spots and specks, but these remained quite infrequent. Instead, the shows looked clean and fresh; the remasters made them look significantly spiffier than their predecessors. Colors also showed a bump up in quality. The series went for bright, dynamic hues, and they actually looked pretty solid in the old transfers. However, the increased cleanliness of the remasters allowed them to seem a little livelier. Blacks remained dark and tight, while shadows demonstrated good definition. These shows weren’t flawless, but they usually looked very good. When it came to extras, the remastered Season Three of Trek mixed old and new materials. I’ll mark new components with an asterisk. If you fail to see a star, then the supplement appeared in the old S3 package. For something new, we find *Billy Blackburn’s Treasure Chest: Rare Home Movies and Special Memories Part 2. This 10-minute and 52-second collection provides comments from actor Billy Blackburn along with his reminiscences about working on the series as Lt. Hadley and some other tertiary or stand-in parts. We also get to see some of the silent 8mm film Blackburn shot on the set. The actor provides some interesting notes about his time on the series, and the footage proves fun to see. To Boldly Go… Season Three presents a 22-minute and 35-second featurette. We find information from actors Leonard Nimoy, George Takei, Nichelle Nichols, Walter Koenig, and William Shatner, Trek activist/author Bjo Trimble, producer Robert Justman, They discuss the campaign to bring Trek back for a third season and issues related to keeping it on the air, Gene Roddenberry’s departure from the series, production changes, the series’ end, and notes about a few particular episodes like “Spectre of the Gun”, “Plato’s Stepchildren”, and “Spock’s Brain”. Not a lot of depth shows up here, but the program gives us some interesting tidbits. The anecdotes prove entertaining and the information becomes generally useful in this decent little piece. 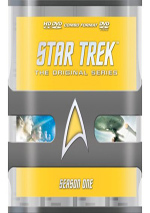 For the next featurette, we get the seven-minute and five-second A Star Trek Collector’s Dream Come True. It presents model and miniature designer John Long as he leads us on a tour of some Trek props that he would replicate. It’s enjoyable to get a closer look at the originals and see their workings as well as the nuts and bolts of the replicas. After this we get Life Beyond Trek: Walter Koenig. In this 10-minute and 57-second piece, we hear from the actor as he discusses how he ended up on Trek as well as subsequent acting work and his collection of comics, toys and other things. Given the distance that so many Trek actors seem to put between themselves and the series, it’s fun to see how Koenig embraces the geeky side of things. Another supporting actor comes to the fore in Chief Engineer’s Log. In the six-minute and 11-second program, we get notes from actor James Doohan. He talks a little about how he landed on the show and the series’ legacy. There’s not much to it, as Doohan - shot in December 2003 - clearly wasn’t doing well enough to offer substantial comments. However, it’s nice to hear a little from him, as he went absent in most of the extras in prior packages. For Memoir from Mr. Sulu, we take eight minutes and 42 seconds to hear from Takei. He discusses his thoughts about what Sulu did after Trek, the series’ impact on his life, and his activities related to the preservation of Japanese-American history. The latter element fills most of the featurette and gives it some heart, especially when Takei gets into his childhood experiences. In Star Trek’s Impact, we get a nine-minute and three-second look at that topic. We find comments from Rod Roddenberry, the son of series creator Gene. He discusses his thoughts about various elements of the series’ philosophy and presentation of various elements. Roddenberry doesn’t delve into things all that well, and these are subjects Trek fans will know, as he mainly reiterates well-known concepts. Two new featurettes appear next. *Collectible Trek lasts 14 minutes, 35 seconds and provides notes from Nimoy, Rod Roddenberry, archivist Penny Juday, model and miniature designer John Long, Art Asylum’s Manuel Jesus, and collector Doug Shannon. We hear about various collectibles related to the series, both in the form of original series props and subsequent licensed pieces. We also get to see quite a few of these elements. This becomes a nice little tour of the different Trek collectibles. For the final featurette, we get the nine-minute and 34-second *Captain’s Log: Bob Justman. We hear from Justman himself as well as Nimoy, visual effects producers Mike and Denise Okuda, illustrator Doug Drexler, and writer David Gerrold. “Log” acts as an appreciation for the now-deceased producer. It avoids becoming a gushy piece of fluff, as it actually gives us nice notes about what Justman did on the series. Though not nearly as famous as Gene Roddenberry, Justman was crucial to the franchise’s success, so it’s nice to see him get credit. Across all seven discs, you’ll find original preview trailers. These are the ads that ran to advertise upcoming episodes of Trek. They’ve appeared on all prior TOS releases, and they remain a lot of fun to see. Does this remastered S3 set drop anything from the prior package? Unfortunately, yes. It loses some still galleries, Easter eggs, and text commentaries for “The Savage Curtain” and “Turnabout Intruder”. Why does this edition omit those components? I don’t know, but their absence creates a disappointment, especially since those text commentaries were very good. 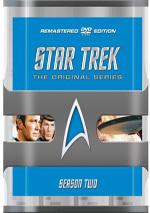 The Original Series remains my favorite of the Trek programs, and I definitely recommend this Season Three package of the show, even though it’s the weakest of the three years. The DVDs present very good picture and audio along with a mix of interesting supplements. Season Two helped Star Trek build its legend, and the programs hold up well after four decades. The Original Series remains my favorite of the Trek programs, though it’s tough to recommend Season Three for casual fans. While it offers some good episodes, it has more clunkers than you’ll find in the first two years. Still, Trek aficionados will enjoy it. If you still have the old two-episode DVDs, it’s probably worth the money to get the improved visuals, the extras, and the space you’ll save; this set takes up much less room than all those separate discs. I can’t make much of a recommendation for fans who already shelled out the bucks for the prior Season Three package that put all the shows in one place. This new release does offer superior picture quality, but I’m not sure it warrants enough of an upgrade given this set’s nearly $90 list price. This one also includes some new extras, but it drops quality components from the prior release. Unless you just can’t live without the updated visuals, stick with the old Season Three set. The remastered S3 release is definitely the one for fans who own none of the prior packages, however. 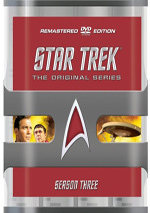 It gives us the highest quality reproduction of Trek.